Artur Tomasevic after winning his first bout. Walton’s TJ Harty cruised into the national quarter-finals of the Junior ABA Championships in Newcastle at the weekend with a polished performance of southpaw boxing. The 14 year-old Kettering School of Boxing fighter was always one step ahead of Graham Swales from Shildon and won unanimously on points to win through to the last eight. He now boxes Jack Donkin in Wakefield this weekend for a place in the semi-finals. Harty scored well in the first two rounds with accurate left hands as the Tyne Tees champion gamely ploughed forward. Swales tried to apply pressure in the third and final round but Harty proved a difficult target to hit and countered well with left-hand jabs and uppercuts to the body to win handsomely on points. There was a winning start for 15 year-old Eastgate lad Artur Tomasevic from the St John Fisher School when he made his ring debut at a show at Banbury. 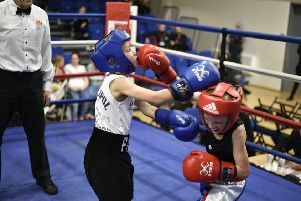 The Peterborough Police Amateur Boxing Club fighter showed great skill, guts and determination to outpoint hometown fighter Aarron Wheeler, who was 12 months older. Tomasevic’s coach Chris Baker was very impressed with his performance. He said: “This lad has come on leaps and bounds in recent months.